Automotive sales tracker R. L. Polk & Co. recently announced that the Ford Focus was the best-selling passenger car in the world in 2012. Impressive! By contrast, Ford Motor Company’s ill-fated Edsel, sold for the 1958-1960 model years, is a dark icon of product failure even today. Ford sunk $250 million into Edsel development; what on earth went wrong? In 1948, Henry Ford II, Ford’s president and son of previous Ford president Edsel Ford, formed a committee to look into the viability of a new car in the expanding medium-priced segment of the automotive market. General Motors, by far the largest of the Big Three auto makers, had Pontiac, Oldsmobile, and Buick as entries in the medium-priced field, while Chrysler Corporation had Dodge, De Soto, and Chrysler. Ford had only Mercury. In April 1955, Ford’s board of directors approved a plan for a new medium-priced product line and created a Special Products Division. To promote manufacturing efficiency and economy, the E-Car, as it was known internally at Ford (E for Experimental, not Edsel), would be built on both the Mercury and Ford platforms, and interchangeability of parts would be maximized. In terms of design objectives, the E-Car would have strong and unique styling elements, making it easily recognizable from the front, side, and rear. There would be unique functional aspects as well. Ford’s plan was to reposition Mercury at the high end of the medium-priced segment to compete against Buick and Chrysler. The E-Car would take Mercury’s former spot, a notch lower in the medium-priced spectrum. Somehow, Ford did not realize this approach was tantamount to creating not one but two new market entries—which would compete against each other. Let’s track the Edsel story through articles in the Readex American Newspaper Archives. For geographically diverse coverage, we’ll call on these newspapers from Massachusetts, Georgia, Illinois, Texas, and California: the Springfield Union, Augusta Chronicle, Rockford Register-Republic, Dallas Morning News, and San Diego Union. By early 1956, development of the E-Car was well underway. What should it be called? Edsel was rumored early on, but members of the Ford family were against it. 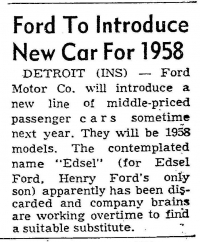 True, Ford was scrambling to find names other than Edsel for the E-Car. The company tasked ad agency Foote, Cone & Belding with submitting potential names. This effort in turn led to asking a poet, Marianne Moore, to suggest names. Her ideas included Utopian Turtletop and Mongoose Civique. After sifting through thousands of possible names and spending tens of thousands of dollars, Ford settled on Edsel. The official announcement came on November 19, 1956, with newspapers reporting the story the following day. Note Henry Ford II’s comment at the end of this article, stating that his company had no plans to build a “low priced small car.” Actually, Robert McNamara, General Manager of Ford Division (and later Secretary of Defense under Presidents Kennedy and Johnson), was already pushing for just such a car. In early 1957, Ford began development of the Falcon. But it was the Edsel, a medium-priced car, whose debut was forthcoming. Was this market segment still strong enough for the Edsel to succeed? In this fascinating piece, George Romney, president of American Motors (and later governor of Michigan and presidential aspirant) is said to believe that the heyday of the medium-priced car was over and that Americans wanted smaller cars. Ford chief research engineer Victor Raviolo thought otherwise. But a few months later, some people within Ford were in fact worrying about the medium-priced Edsel’s prospects. Publicly, though, Ford remained confident. Nope, no gamble, said D. Edward Manning, Edsel Division district sales manager. Ford had undertaken extensive market research—that much was true—and this “proved” the viability of the medium-priced field. The Edsel program would move forward. 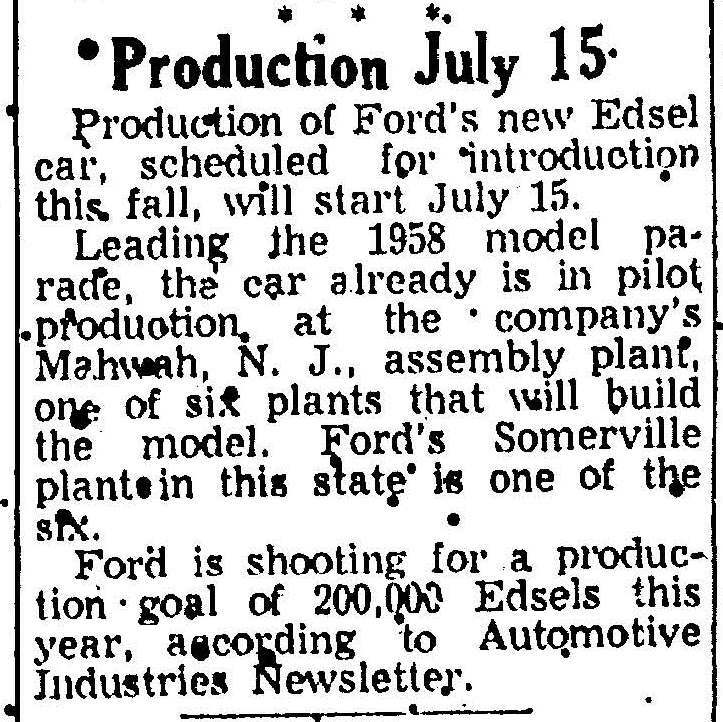 Edsel production was set to begin July 15, 1957. In the beginning, four Ford Motor Company plants were engaged in Edsel production: Mahwah, New Jersey; Somerville, Massachusetts; Louisville, Kentucky; and San Jose, California. Early on, Ford decided the Edsel would be sold through its own brand-new dealer network. Ford wanted 1,200 dealers in place well before the Edsel went on sale. Many of these dealers were new to the auto business, thereby adding yet another element of seemingly unanticipated risk to a successful Edsel introduction. Some longtime auto dealers, such as J.R. Townsend of San Diego, dropped their existing franchises and signed up for Edsel sales. Many dealers would regret their choice. A formal press conference on August 26, 1957, introduced the Edsel to an eager and curious public. Plenty of Edsels were on hand, demonstrations were made, and members of the media were given the opportunity to do test drives themselves. Clearly, the Dallas Morning News business editor was impressed! 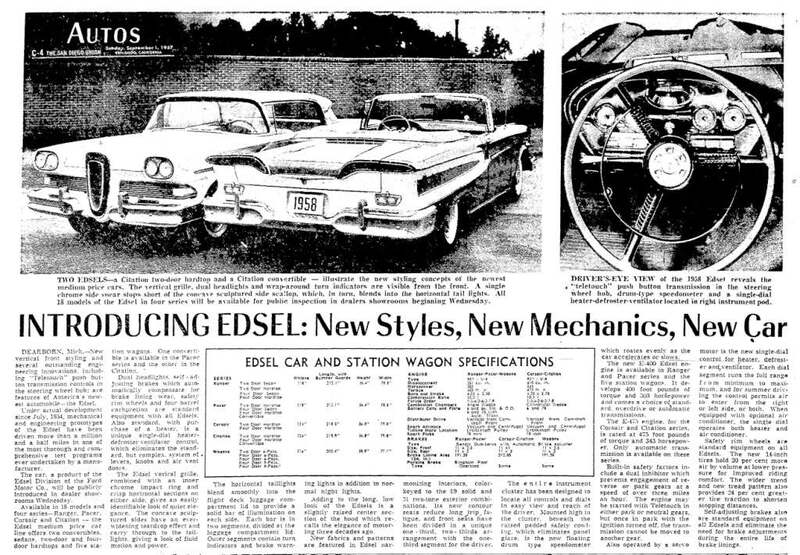 Edsel images and product specs and features were offered that weekend in the San Diego Union. Well, at last, there it was. Horse collar grille, wrap-around bumpers, scalloped side inserts, gull-wing taillights, Teletouch Drive push-button transmission control (with the buttons in the center of the steering wheel), floating-drum speedometer, powerful E-400 and E-475 engines . . . who wouldn’t want one of these? 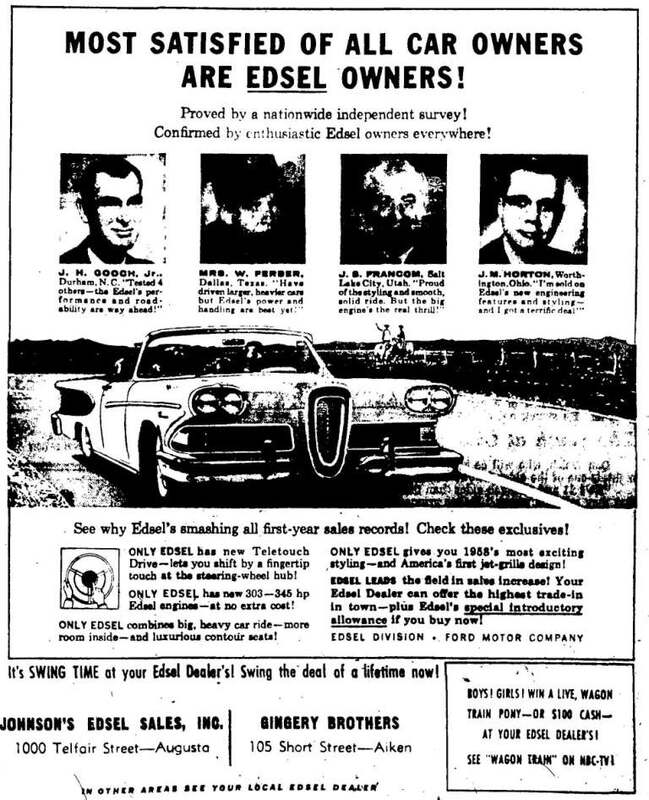 On E-Day, September 4, 1957, the Edsel went on sale nationwide. 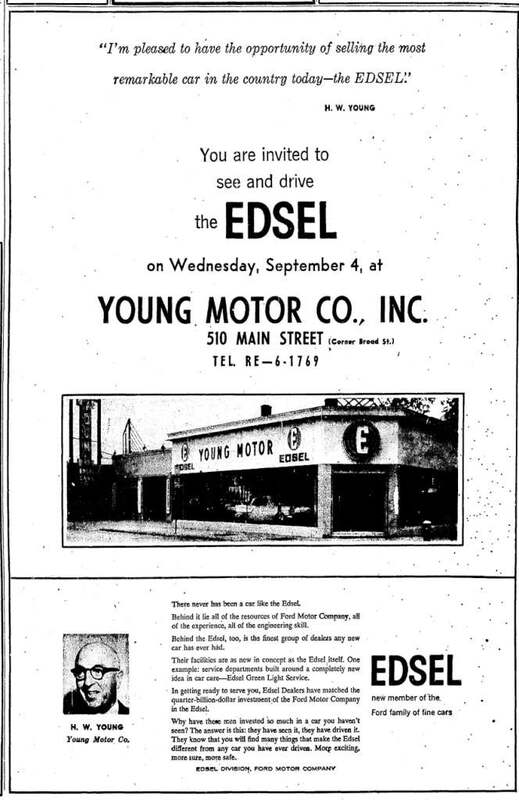 Ford Motor Company and its Edsel dealers placed ads heralding E-Day. 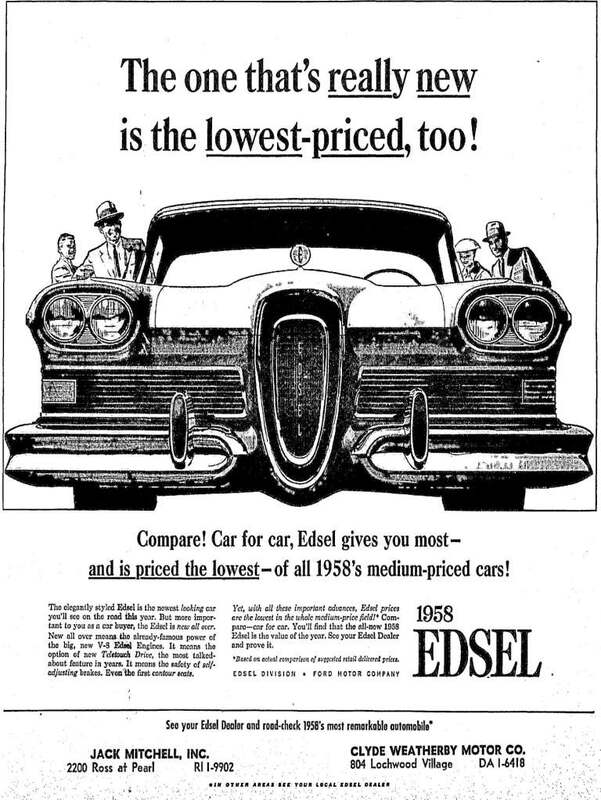 The Edsel saw good initial sales in Michigan, the Southwest, and the East. 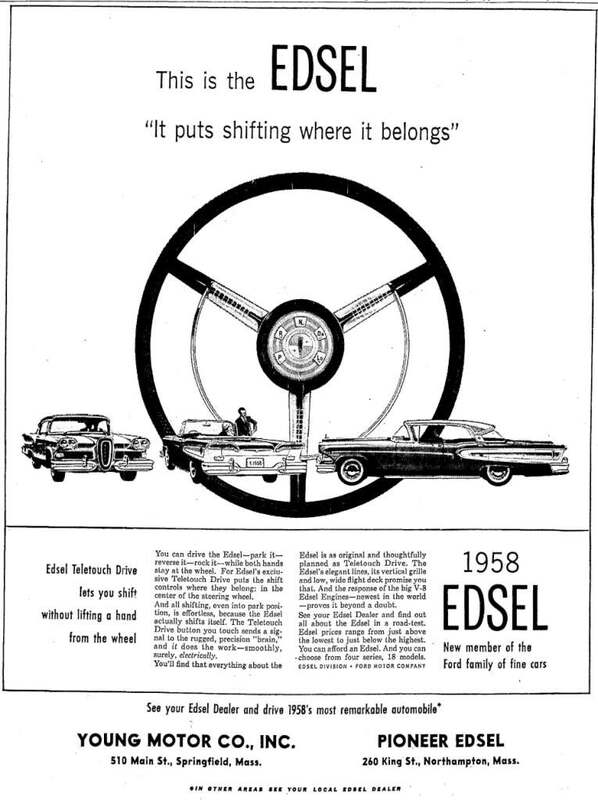 Edsel ads continued after E-Day, emphasizing things such as its touted Teletouch Drive transmission system. Even if Teletouch Drive—available on only a few Edsel models anyway—“put shifting where it belonged,” it did not work very well. And many drivers inadvertently hit the horn when they wanted to shift. 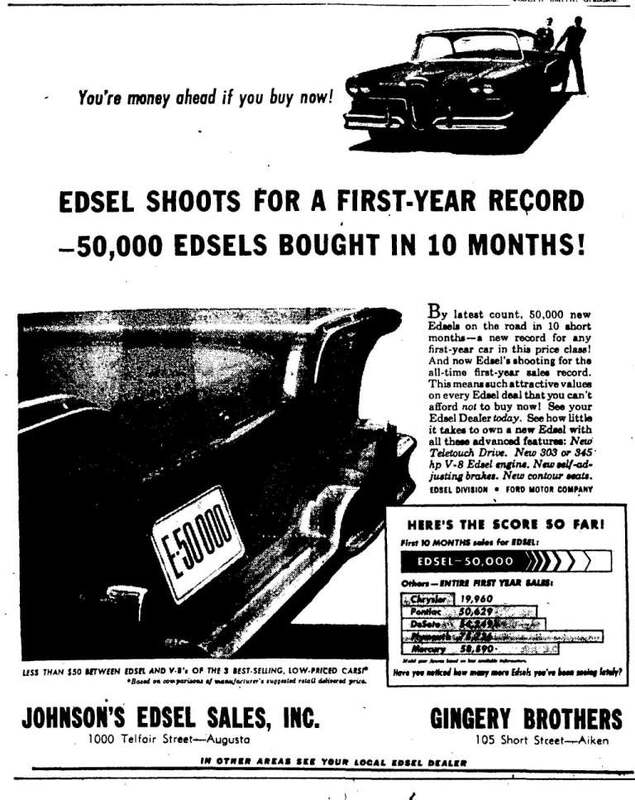 By November 1957, Edsel sales were less than hoped for. Was price a problem? It was certainly one of the problems. As stated earlier, Edsel was supposed to fill the market gap between Ford (low-priced) and Mercury (formerly medium-priced, now high-medium-priced). In reality, the lowest-priced Edsel, at $2,519, was all of $20 more than the highest-priced Ford. The highest-priced Edsel, at $3,801, was $1,254 more than the lowest-priced Mercury. So much for distinct market segmentation. Ford’s panicked response made things even more confusing for consumers, at least those buying on price. “Low price” became Ford’s theme, as seen in subsequent ads. Barely three months after E-Day, Ford was becoming worried. Note the gloomy economic headlines on this same page of the Springfield Union. Yes, the USA was entering a recession. In January 1958, with Edsel sales too low to justify a separate division, Ford folded the Edsel Division into the Lincoln and Mercury Division, with the consolidated unit named the Mercury-Edsel-Lincoln (MEL) Division. Not a good sign! As the recession deepened, all auto makers experienced soft sales. Dealers sought relief from Congress, to no avail. Meanwhile, the ads continued to run—often placed, coincidentally enough, on the obituaries page. An omen, perhaps? In fact, many Edsel owners were NOT satisfied. 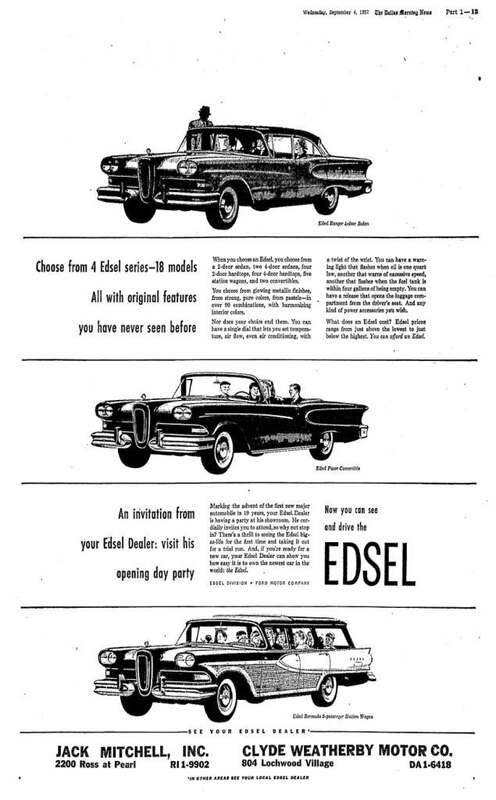 Quality control over the new Edsel—critical for early, potentially positive word-of-mouth success—was all but absent. Ford was building Edsels on existing Ford and Mercury manufacturing lines, and gave no emphasis to Edsel-specific training. The focus was on hurrying and making as many Edsels as possible. Some Edsels arrived at dealers with such shoddy build quality that dealers had to sink time and money into making the cars presentable—or even saleable. Note the box in the lower right of the preceding ad. Grasping for straws, Ford was now sponsoring the TV show “Wagon Train”—and occasionally awarding a pony, of all things, to people who test-drove an Edsel. The pony campaign succeeded only in bringing more headaches—but not sales—to increasingly forlorn Edsel dealers. By historical standards, sales of 50,000 for a rookie automobile were actually quite good. But Ford had—unrealistically—hoped for 200,000. Trick or treat! 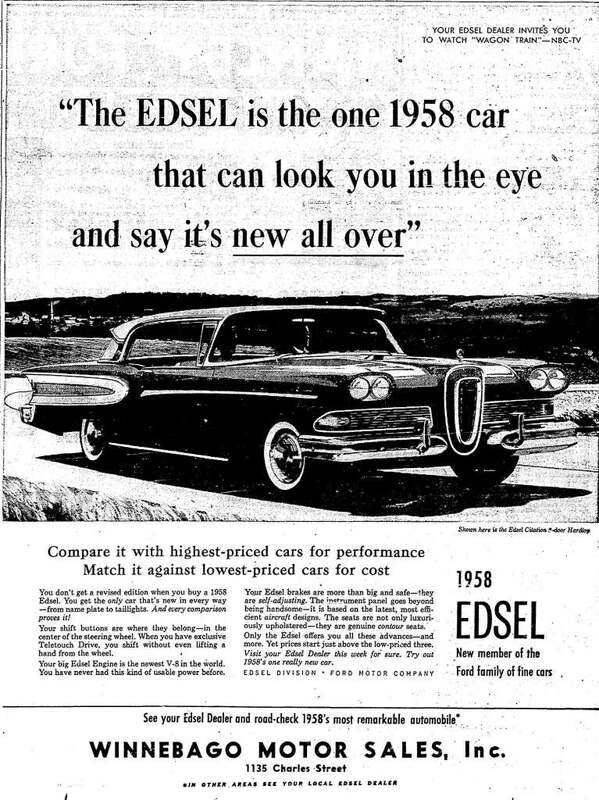 On October 31, 1958, the 1959 Edsel was advertised for sale. Eighteen models—in truth, probably too many—had been available for the 1958 model year. But Robert McNamara, now president of Ford Motor Corporation and a longtime opponent of the Edsel program, saw to it that only ten Edsel models were offered for 1959. The 1959 Edsel most noticeably toned down the front grille, arguably the most distinctive styling element of the 1958 car. Ford had certainly heard the jokes about the 1958 grille looking like a toilet seat. Or a component of female genitalia. Or that the 1958 Edsel looked like an Oldsmobile sucking a lemon. 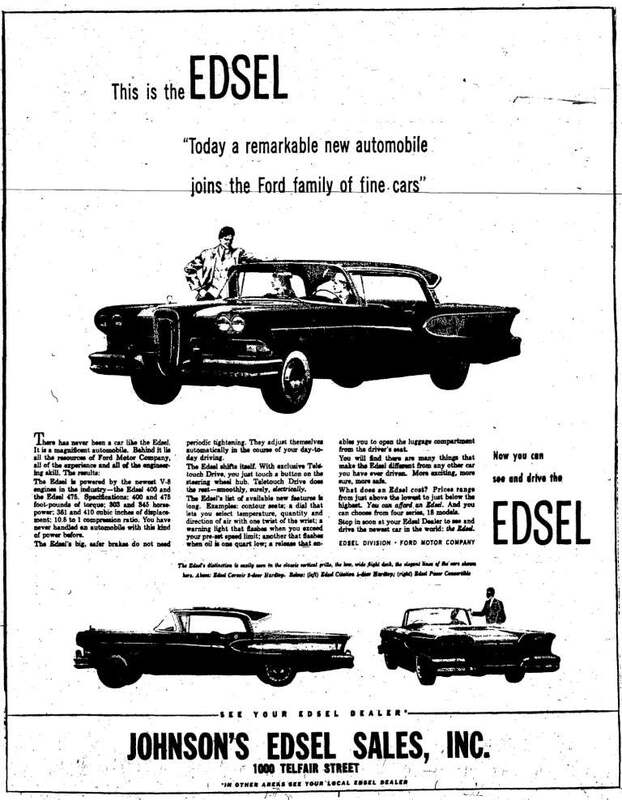 Many boasts in this ad seem more like atonements for things Ford realized had gone wrong with the 1958 Edsel. 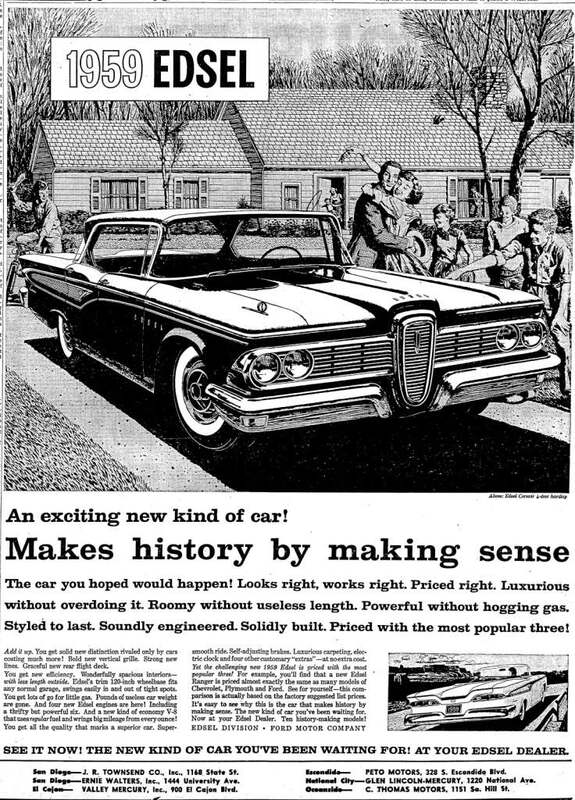 But the Edsel would soon make history—by becoming history. 1959 Edsel sales started soft and stayed soft. 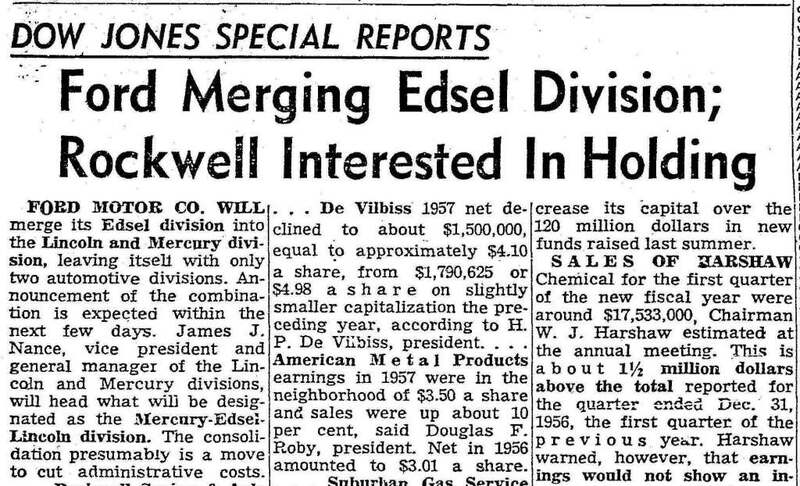 By spring 1959, only the Louisville plant was producing Edsels, and in limited quantities. In September, Ford announced a forthcoming car that could have been a lifeline for Edsel. Yes, Ford was now ready to enter the compact car arena—but would sell the Comet through Mercury dealerships. Originally, Ford planned to release the Comet as an Edsel product for 1961, at which time it would replace the full-size Edsels (note the reference to ‘Edsel B’ in the Dallas Morning News article). In fact, early Comets had tail lights and other parts with E-prefix part numbers. Ford Motor Company archives hold photographs of clay design models of the Edsel Comet. Meanwhile, it was time to introduce the 1960 Edsel. With the ship sinking, the line-up was further reduced to only seven models, set to go on sale October 15, 1959. True, the 1960 Edsel was a very different car than the 1959 edition. But it was little different—and not even skin-deep different—than the 1960 Ford. This is easily seen by comparing the Ford and Edsel photos and specifications in the San Diego Union article. So, how would the 1960 Edsel sell? If you blinked, you missed it. On November 19, 1959, Ford announced all Edsel production was ending. With Ford pulling the plug after only five weeks in production, the 1960 Edsel became the only automobile in history that was never actually produced in its model year. Ford’s Comet compact car went on sale March 17, 1960. With the Edsel line terminated, Ford sold the Comet through Mercury dealerships, although the Comet was not officially branded as a Mercury until the 1962 model year. The Comet was a huge success. Had Ford stuck with its plan for an Edsel Comet and allowed the Edsel nameplate to live a little longer, the Edsel might have wound up a success rather than a failure. And, Comet aside, even the hallowed medium-priced market perked up in the early 1960s. But thanks to a multitude of poor management decisions by Ford, plus just plain bad timing, the Edsel’s die as a loser was cast. Aw! THAT’S not very nice! Bruce D. Roberts has adored the Edsel ever since he unsuccessfully lobbied his father to buy one in 1957. He occasionally threatens his wife with acquiring a 1958 Edsel Pacer, but since he knows nothing about maintaining classic cars, he has yet to follow through on this. However, he does maintain Edsel Promo Time, a website devoted to dealer promotional models of Edsels. Bruce has also studied, collected, and written extensively about nineteenth-century advertising cards for more than three decades. He published Clipper Ship Sailing Cards (2007) and Mechanical Bank Trade Cards (2008), both available through Lulu.com. He has published several articles in The Readex Report, most recently "Images of Women on Clipper Ship Sailing Cards."